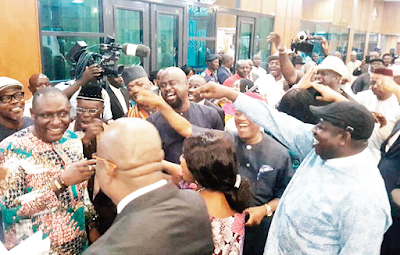 The ruling All Progressives Congress (APC) has lost 37 members to the opposition Peoples Democratic Party (PDP) and the African Democratic Congress (ADC) in a gale of mass defection that swept across the National Assembly yesterday. In the Senate, APC lost 14 senators to the PDP. For the ruling party, it was a dark day with the depletion of its ranks in both the chambers of the National Assembly. On its part, the PDP also lost one member to the United Progressive Party (UPP); meaning 38 lawmakers changed party yesterday. Although, the House leader, Hon. Femi Gbajabiamila, has boasted that the APC still maintains majority in the chambers, the PDP has declared that this is just the first batch of defectors as more APC members would leave for PDP in the next few weeks. With the defection, the APC now has 185 members, PDP –160, APGA –5, ADC –4, while Accord party, Labour Party and Social Democratic Party (SDP) have one member each. There is one vacant seat, which is yet to be filled. While 32 of the defecting members joined the main opposition party, the PDP, four joined ADC with one yet to identify with a new platform. The members that defected from APC to ADC are Sunday Adepoju (Oyo), Olugbemi Samson (Oyo), Taiwo Michael (Oyo), and Olasupo Abiodun (Oyo). The APC members that defected to PDP are Garba Umar (Kano), Olayonu Tope (Kwara), Ahmed Garba (Kano), Kabiru Marafa (Sokoto), Zakari Mohammed (Kwara), and Abubakar Amuda-Kanike (Kwara). Others are Aliyu Madaki (Kano), Hassan Saleh (Benue), Ahman Pategi (Kwara), Mark Gbillah (Benue), Shehu Usman (Kano), Aminu Shagari (Sokoto), Nuhu Danburam (Kano), Atunwa Abdulrazak (Kwara). Also Salisu Zakari (Bauchi), Hassan Omale (Kogi), Emmanuel Orker-Jev (Benue), Rufai Chanchangi (Kaduna), Abdulsammad Dasuki (Sokoto), Sani Zoro (Jigawa), Benjamin Okolo (Kogi), Funke Adedoyin (Kwara), Bode Ayorinde (Ondo), Bashiru Salihu (Sokoto), Barry Mpigi (Rivers). The rest are Nasiru Sule (Kano), Segun Ogunwuyi (Oyo), Lawal Rabiu (Kaduna), Sani Rano (Kano), Dickson Tarkighir (Benue), Musa Ado Tsamiya (Kano) and Emmanuel Udende (Benue). Meanwhile, the PDP lost one of its members, Hon. Tony Nwulu, representing Oshodi/Isolo federal constituency of Lagos to the United Progressive Party (UPP). Nwulu presented his letter of defection to the speaker after the plenary. While briefing the press, Nwulu said his decision to dump the PDP was consequent upon irreconcilable differences in the state chapter of the party. He becomes the 38th lawmaker to defect. In their letter of defection read by Speaker Yakubu Dogara at yesterday’s plenary, the lawmakers cited division at all levels of the APC as the reason for their defection. While the four lawmakers from Oyo who defected to ADC submitted a separate letter, the other 32 also presented a joint letter of defection. But shortly after the speaker finished reading the two letters of defection, chairman of the House Committee on Rules and Business, Orker-Jev, announced his resignation from the APC, but could not disclose his new party. His defection made it 37. He cited division in the APC as his reason for leaving the party. Reacting to the defection of 37 APC members, House leader, Hon. Femi Gbajabiamila lamented that it was sad they left, but expressed happiness that the APC still “controls overwhelming majority” in the lower chamber. Briefing the media after the plenary, Gbajabiamila said: “Let me say it is always sad when people lose one member, those members were part of the family and I would say very quickly, they are also welcome at any point in time they realize the errors of their ways. “I want Nigerians to know that not only does APC remain the majority of the House, APC is actually a clear majority in the House. I believe those who wanted to defect were expecting about 60 members, but they got half.